Studies have shown positive benefits of natural daylight on human physiology and psychology. Employees are shown to be more productive when exposed to daylight. The penetration of daylight into buildings are facilitated by the installation of skylights on the Seattle roofing. The natural lighting from the sun also creates an energy-efficient building that ultimately results to lower power bills. Because of these direct benefits from skylights in Seattle roofing, more contractors are placing emphasis on this very-useful feature of a building. 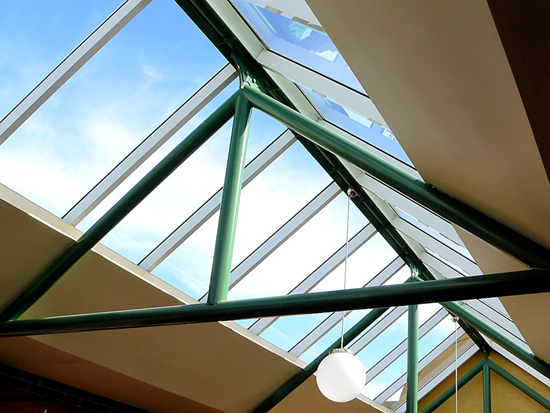 With the popularity of skylights come the need for information on the performance of different glazing options for skylights. A common material used for skylights. Glass is scratch-resistant, durable and lasts long. Different kinds of glass provide various benefits such as energy efficiency. For instance, tempered glass is used for insulating glass units to provide a sealed and moisture-free glaze. A coated laminated glass is ideal for those who prefer diffuse light. Fiberglass is translucent and available as flat, domed, monolithic or other profiles such as two panels with air in-between for insulation. While the material per se is not durable, it can be attached or bonded to I-beams to create translucent structural panels that have high insulation properties and come in a variety of colors. Translucent fiberglass panels are lightweight but impact-resistant and shatterproof. They are strong against ultraviolet radiation and weather-resistant. Some of the interesting qualities of polycarbonate are its durability, impact-resistance and easy-to-cut design. They are produced as multi-wall sheets or monolithic sheets. The latter, filled with aerogel known as “frozen smoke,” can be cut to suit the skylight design and are lightweight. It greatly minimizes noise and diffuses light to reduce if not eliminate glares and hot spots. This material is the most formable among skylight materials and is widely-used for standard skylights. Acrylic plastics come in many forms and standards – some are transparent to ultraviolet rays and, therefore, weather well while others are manufactured to be durable and impact resistant. Acrylic sheets are available as transparent or translucent types.